SEATTLE- In what looked like a game into the Seahawks future, a pair of dazzling rookies wreaked havoc all over the San Francisco defense. Wide Receiver Tyler Lockett notched two scores through the air, while Running Back Thomas Rawls rushed for a score, and caught another one from Russell Wilson. Offensively, this game was a textbook example of how Seattle’s offensive line should have been working out for the majority of the season, providing effective blocks so that Rawls could rush for a franchise record setting 209 rushing yards in a single game (he’d end this game with 255 all purpose yards). Wilson was 24 of 29, for 260 yards and three TDs, despite taking two sacks. He had plenty of time to make successful handoffs, or progress through some passing options. Jimmy Graham got involved, gaining three successful first down conversions, while Rawls made mince meat out of opposing tacklers, most notably San Francisco corner back Trumain Brock, as Rawls was running down the sideline and Brock attempted to tackle him out of bounds. Rawls simply lowered his head and ran into Brock away from the sideline, knocking the corner to the field and scrambling to finish the tackle. He would grab Rawls ankle, but the drive went for a first down after Rawls put his foot down. Tyler Lockett ran swiftly and with fury, catching his first score off of a lofty Wilson pass, and the second near the goal line, into coverage and contorting his body to get in the end zone. He’d finish the game with 48 total yards (4 receptions off of 5 targets), and two TDs. As with the growing trend, Seattle scored in the 4th quarter, now in two of their last three games. The offensive woes seem to be on the mend. Opposing QBs, take note: If your offensive line leaves defensive end Cliff Avril in one-on-one or limited coverage, he’s getting to the quarterback, and he’s going for a sack. He’s got 4.5 in the last four games alone. Quizzically, no interceptions were recorded by the Seahawks defense, though there were a number of close calls where the ball was tipped or bounced out of their hands (as both K.J. Wright and Marcus Burley were unable to hold on to them). The Seattle defense again gave up a score to an opposing tight end, for the lone Blaine Gabbert TD to Vance Macdonald. Corner back Cary Williams was benched in the second half of the game, while DeShawn Shead stepped in at corner opposite of Richard Sherman. Outside of allowing 59 yards rushing, the Seattle Defense held San Francisco to only 247 receiving yards, and more importantly, gave up no scores to the opposing team in the 4th quarter. A number of injuries occurred in the game, mainly Center Patrick Lewis (Ankle), Doug Baldwin (Ankle), neck stingers for both of the starting Guards Justin Britt and J.R. Sweezy, the majority of them occurring in the last quarter, which could have spelled disaster. The most frustrating thing could be the pair of missed point after touchdown kicks by Steven Hauschka, one in the 1st quarter, and one in the 4th quarter. Hauschka has not missed that many points after the touchdown kicks in this season or last (He’s 19 for 21 extra points in 2015, and went 41-41 for extra points in 2014). After the game, head coach Pete Carroll said of the team’s playoff hopes: “We have a huge game coming up next week. We need to find the consistency that gives you a chance to make some noise later on…There’s a lot of football left to be played”. Up next for Seattle is the Pittsburgh Steelers (6-4), an AFC North team anchored by a pair of standout wide receivers (Antonio Brown and Martavis Bryant), who factor to keep Seattle’s corners awfully busy. While Pittsburgh’s QB, Ben Roethlisberger, has shown he can be mobile, Pittsburgh’s strength really rests in the arm of Big Ben. It will take almost every effort of the line backing corps of Seattle (currently projected to be down Bruce Irvin, nursing a sprained MCL/knee), defensive ends (Bennett and Avril, heading into this game with 6.5 sacks apiece! ), and the trio of corner backs to hinder (or contain) the passing game of Pittsburgh. If you recall, the Steelers beat the Cardinals in week 6, off of the arm of backup QB Landry Jones, and an 88-yard bomb to (who else?) Martavis Bryant. De’Angelo Williams, running back for the Steelers, has enjoyed a resurgence of sorts this season. 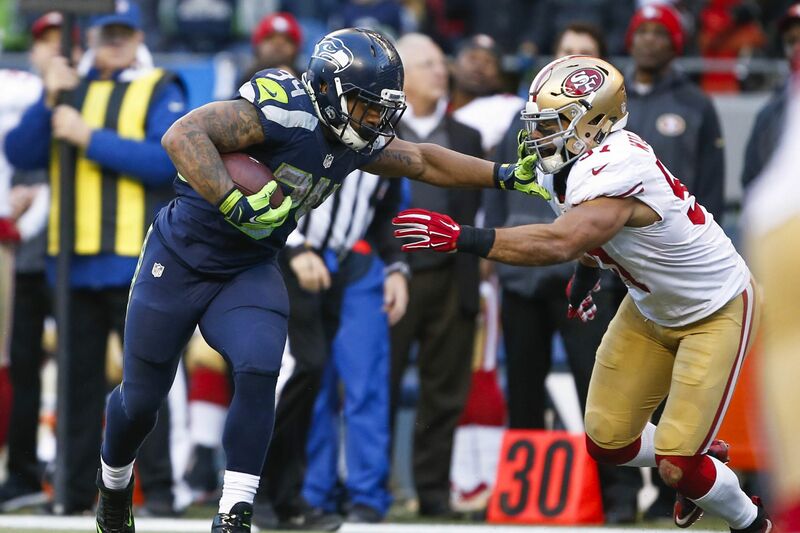 Seattle has been able to contain running backs for the majority of the season, and looks to keep it going on Sunday. The Steelers secondary is beatable, and there’s a favorable matchup afoot for an offensive shootout (the Steelers has scored at least 30 points in back to back games). The game is in Seattle, where the Steelers are 1-6 all time. Here’s to that record going to 1-7.